The BPS District Library Media Center at Hughes provides instructional resources and equipment for teachers from BPS and area public and private schools with Teacher Center memberships. The tables are available for teacher staff development, PLC, curriculum work. The district library collaborates with education departments at University of Mary, Dickinson State at BSC campus, United Tribes Technical College to serve university education students. Library media specialist, Charlotte Hill, and library assistants, Mollie Mihelich and Laura Rysavy kept the BHS library atmosphere for learning, research, reading, collaboration etc. open for the many classes who visited during the year. We hosted a 3rd grade class from Will-Moore elementary who had partnered with an English class to correspond and read together. After collaborating with many different departments, LibGuides were created and classes were instructed on how to correctly use the guides for one stop research. The Parenting classes were assisted in choosing an easy book to read to the preschool children they would be working with. Senior classes were given direction on the best print, online resources, and citation services to use for the research process. Many creative displays showcased the new print/eBook resources purchased. The Century High School library continues to be a hub of high school life. Classrooms visit the library to collaborate, use computers and resources, and research using both print and online materials. The library is used to display altered book art projects and a Civil Rights Museum. Library media specialist, Gina Phillips, and library assistants, Wynn Reinbold and Lorraine Nelson create an inviting and safe environment for all students at CHS. CHS Gamers club hosted a Smash Brothers Tournament and library programming included an "old school love letter station." Students LOVED being able to use the vintage typewriters to write notes to their friends, parents, and teachers. Legacy High School students in English 9 celebrate while playing an online Kahoot game reviewing their knowledge on primary and secondary sources. Library Media Specialist, Maggie Townsend, taught a lesson in conjunction with the classroom teacher. At South Central High School, Mandi Clausen, library media specialist, has worked to build the library collection at South Central High School. South Central continues to shape the skills of young parents through a young parent group that meets with the School Social Workers and continues to build its infant to age 5 library collection to increase the circulation of materials for our young parents. We are excited to see all the new changes that are happening now at SCHS with the new partnership with Youth Works. The Horizon Middle School library staff, Mrs. Berg, library media specialist, and Mrs. Bahr and Mrs. Niemuth, library assistants, empower students to be enthusiastic readers, critical thinkers, skillful researchers, and ethical users of information. Pictured here are some examples of student-centered activities and events: Spin to Win! (School-Wide Scholastic Book Fair); SpeedBooking (6th- 8th grade activity) Jerry Pallotta "Who Would Win" (author visit/6th grade research project); Brainy Board Game Day (8th grade activity); "I Saw it on the Internet, so it MUST Be True" (6th grade web site evaluation activity); (Sustained Silent Reading (6-8th grade activity); "Wasted Future" (7th grade PBL research project); and Chris Rylander (6th grade author visit). Simle Middle School library is a hub of activity every day. Pictured at the computers is a class of eighth grade students performing tasks on a research project for health class. Previously, Mrs. Robin Kress, library media specialist, led a lesson on using Google Research and Add-ons. At the same time, a sixth grade reading class visited for silent reading time. Mrs. Tracy Diede, library assistant, helped students find reading materials, and students took advantage of the comfortable seating to enjoy their books. Makerspaces are a new trend in our 21st Century libraries. Mrs. Jane Wolf, Wachter library media specialist, and Mrs. Marilyn Schneider, library assistant, have developed a creative, DIY space for students to gather, allowing them to create, invent, and share. This year, students have had an opportunity to let off some "STEAM," showcasing science, technology, engineering, arts, and math skills. Wachter Makerspace Club student mentors help develop and lead activities. This picture captures students trying to build the tallest and strongest "Leaning Tower of Pasta" using spaghetti and marshmallows. Students are also amid "Lego Mania," a time for exploring, building, and creating. Holiday Ornament Creation and Pumpkin Carving Craze were also times students could show off their skills to "Make it @ Our Library." Centennial Elementary library has received 26 Chromebooks, courtesy of Centennial's PTO. This has been one of the biggest highlights for Centennial library. Classroom teachers and library media specialist, Rhonda Bothwell, have been working with students in grades first through fifth grade on many projects using Google Docs, Google Slides, and how to share. Assisting with library services is library assistant, Robin Volk. Library media specialist, Crystal Molzahn, introduced Grimsrud 4th grade students to Google Classroom. The students used this with Google Docs and Google Drawing to collaborate, share, and create biographies written about one of their fellow classmates. Library assistant, Karla Lobsinger, has made the library an exciting and welcoming place through her wonderful displays. Lincoln students experienced a variety of unique learning opportunities with library media specialist, Barb Sandstrom, and library assistant, Levi Kalsow. One goal was to begin the process of transforming the library into an "intellectual gymnasium" where LMS, teachers, and students worked to create weather reports using green screens and WeVideo, animal animation with Animate It, book reviews, and persuasive Glogster/Animoto commercials on The Water Project which were presented at the 3rd grade Water Festival. Another goal of the "intellectual gymnasium" process was to create labs where challenges were designed to "spark" student interest, investigation, and experimentation. Throughout the year students learned that meeting a challenge often takes patience, initiative, and lots of trials and errors! Dorothy Moses elementary students are using the new Samsung tablets to scan QR codes linked to book trailers made by 5th graders. The 5th grade teachers and the library media specialist, Crystal Molzahn, worked together to use the students' persuasive writing as a jumping off point for their book trailers. Also helping students with book selection is library assistant, Sandra Stephens. Murphy Media Center uses a variety of ways to keep students engaged and help them become lifelong learners while focusing on standards/benchmarks. Library media specialist, Gail Stein, and library assistant, Mary Jane Kadrmas, create a library atmosphere to keep the fun in reading and learning! A few examples of media lessons/activities are the following: creating student biographies, researching, using technology to create projects, use of games/gaming, author visits, reading celebrations, Makerspaces, Heavy Metal Kidnapping, Fribble, Mr. Waffles. A Makerspaces Club was started this year for the fifth graders at Myhre by Library media specialist, Peggy Kopp, along with Charlotte Sather, library assistant. Small groups of different students met and completed projects in Zentangle, Voice Thread, origami, and cross stitch. The Makerspaces groups shared their projects with the rest of the fifth grade students. The origami group taught the rest of the fifth graders how to create different origami projects. Northridge Elementary students have been introduced to Makerspaces by Mandi Clausen, library media specialist, and Alisha Kelim, library assistant. A Lego community Makerspace encourages collaboration, communication, and creativity. Bridge Building is a second Makerspace that was completed by students at Northridge. Makerspaces allow students to collaborate, use creative thinking skills along with inventive thinking to complete projects. The Pioneer Library has been a busy place this year. Rhonda Bothwell and Peggy Kopp shared duties as the library media specialists along with the support of library assistant Sharon Drechsler. The fifth grade students collaborated as a group and created digital stories based on popular picture books. They created story boards, took pictures, and prepared presentations to share with their classmates along with other students in the school. It was a great learning experience. The third and fourth grade students worked on many different computer and library skills. Kindergarten, first, and second grade students concentrated on technology standards. We worked on getting familiar with how to logon using our username and passwords, typing something in word and saving. We have had an enjoyable year getting to know one another and learning many new strategies in the computer lab. Prairie Rose Elementary students work with library media specialist, Stacy Olson, and library assistant, Julie Bitz, to celebrate reading and information literacy. The students created a variety of projects this year including comic and animated stories, commercials and newscasts about the importance of recycling, and narrated biography slideshows. As part of the reading month celebration students participated in a Book Trivia "Game Show" using Kahoot to test their knowledge of book features and popular children's literature. At the Roosevelt Library, students with library media specialist, Andrea Weikum, used 21st century skills of collaboration and creativity to create project based learning projects. Library assistant, Joyce Wangler, created an invigorating and inviting library for the students to enjoy! At the Saxvik Library, students with library media specialist, Andrea Weikum, dug into project based learning projects, researched, and created creative projects. Students used many different Web 2.0 tools to inspire new learning. Library assistant, Kelly Humann, created beautiful displays for the library and assisted students in finding right fit books! Many exciting things are happening at Solheim Elementary Library this year. We are very excited that our library assistant, Sheila Roth, was named BPS's instructional aide of the year! Students reorganized the fiction section of the library into genres to make it easy for students to find books to read. We also worked hard to provide more access to technology by using fundraisers to help get more devices into the hands of students. The library was awarded over $8,000 to purchase needed supplies such as digital cameras, Chromebooks, microphone headsets, and supplies to begin creating our makerspace. Grades 3-5 participated in lunch time books clubs and an after school maker club. The library media program with library media specialist, Misti Werle, collaborated with many teachers to support classroom learning through research, digital projects, and resources. Sunrise elementary students with library media specialist, Lesley Gunderson, and library assistant, Carrie Berg, reached the reading month goal and went beyond it! Goal: To read 2015 books during the month of February. Prize: Watching teachers and principal get hit with whipped cream pies! What a PIE-tastic celebration of reading! At the Will-Moore Library, the students with library media specialist, Andrea Weikum, used creativity and critical thinking skills at the Makerspace stations. Students used technology to create innovative projects. Students presented projects to other students, encouraging communication and a sense of community. Library assistant, Nancy Brown, created a welcoming space where she shared her love of the library and encouraged students to become life-long readers. The BPS District Library Media Center at Hughes provides instructional resources and equipment for BPS teachers and for teachers from area public and private schools with Teacher Center memberships. The district library collaborates with the education departments at University of Mary, Dickinson State at BSC campus, and United Tribes Technical College to provide university education students with resources for lesson plans and the equipment to design educational projects and activities. The BHS Library had a number of Project Based Learning activities centered in the library this year. One of the staff favorites was Ms. Ann McKenzie's Reward Challenge #3 in her Survivor: Lord the Flies unit where student tribes try to outwit, outplay and outlast the other tribes with different reward challenges. The #3 involved reading a list of questions and finding a book in the library that had the answer to the question in the title. Each answer was only one word and there of course are not enough books for each tribe to answer every question so may the best tribe win. Charlotte Hill, Librarian, along with her very capable staff, Mollie Mihelich and Laura Rysavy, spent time in classrooms teaching Noodletools, the district citation/research paper database as well as hosting classes in the library for research, orientation, and projects. Collaborating with staff to set up LibGuides for the students to do one stop shopping for their research was a big hit. A student survey earlier in the year showed us that students at BHS find the library services and staff very helpful and appreciated. Student usage and book circulation for leisure and independent reading were up so we feel we end the year on a high note. The CHS library was the location of several Project Based Learning presentations this year, including Mrs. Feland's Civil Rights Museum. Students researched the Civil Rights movements of the 1960's, reflected on the connection to the modern world, and displayed their understanding through the use of interactive museum components and visual materials. The students were very creative: games, a large bus, and a re-enactment of the Woolworth Counter Sit-ins using Minecraft! The CHS library media center received a grant from the BPS Foundation for the purchase of new graphic novels, purchased over 200 new books, and created a section specifically for the graphic novels. Assisting with library services through this process are library assistants, Donna Geiger and Wynn Reinbold. The CHS Gamer's, a club with over 40 members, met in the library twice per month under the advisement of Gina Phillips, library media specialist. After setting up a temporary location at the BPS Career Academy, the Legacy High School Library was ready to serve its students and faculty. Their innovative location enabled the library staff of library media specialist Maggie Townsend and library assistant Kayla Maedche to assist LHS faculty and students, Career Academy and Tech Center staff, and BHS and CHS students. English teacher Annie Volk and Maggie Townsend collaborated to guide students to answer, "As advertising executives, how will you convince your client to choose their citation generating product and train them to use it?" Using the 21st century skills of collaboration and creativity, student groups created sales pitches that were presented to an audience. They also developed online tutorials using a variety of video editing, web-based applications, and print resources. At South Central High School, Maggie Townsend, library media specialist, with the help of Leslee Webb, social worker, met with the young parents' group to promote and teach early literacy strategies that the parents can use with their children. South Central continues to build its infant to age 5 library collection. Young parents and child development classes readily take advantage of these resources. With the implementation of a daily, cross-curricular sustained silent reading time, circulation of books continues to grow. Inspired by Jerry Pallotta's "Who Would Win?" series, Ms. Picard's 6th graders conducted short research projects in the library to answer a question, drawing on several sources and refocusing the inquiry when appropriate (ELA-06.W.07). Working with Kathy Berg, the library media specialist, students utilized books, databases, and approved web sites as they selected 2 animals to research and completed the graphic organizer of information. Then, they created a poster board representing the characteristics of each animal. On the back of the poster, students created a checklist of characteristics so the reader could choose "Who Would Win" - if they battled against each other. As a culminating activity, they wrote 2 - 3 paragraph argumentative summaries to support claims with clear reasons and relevant evidence (ELA-06.W.01). Students utilized NoodleTools to create Works Cited pages for all of their resources and GoogleDocs to write their argumentative summaries. Assisting with library services through this process are library assistants, Laura Bahr and Leanne Niemuth. The Simle Middle School library has been the hub of several Project Based Learning activities this year. Presently, Mrs. Ziemann's eighth grade students are collaboratively working on a planet or dwarf planet project (ND 8.5.10). Students, with their teacher's assistance, formulated a driving question and are now using library services to research (ND 8.2.4). Library media specialist, Robin Kress, led a lesson on using databases, evaluating sources, and NoodleTools, the citation and note-taking composer. Students will choose a technology tool, such as Prezi or Powtoon, to create a presentation to teach other classmates their findings. Tracy Diede, library assistant, is proud to announce a significant increase in book circulation this year. North Dakota Studies students are busy promoting North Dakota! Throughout the year, students utilized the library to research, evaluate, organize, and cite information. They also explored a variety of technology tools, allowing them to create and communicate. Mr. Prokop's students are working on their culminating project, producing a travel brochure for their own North Dakota travel agency. Students related the Dakota Territory homestead settlement boom to our current oil boom. Students researched North Dakota tourist attractions, culture, historical places, fun facts, and promotional posters from the 1800's. Jane Wolf, library media specialist, and Marilyn Schneider, library assistant, help students utilize books, databases, and web sites for research and assist with technology. 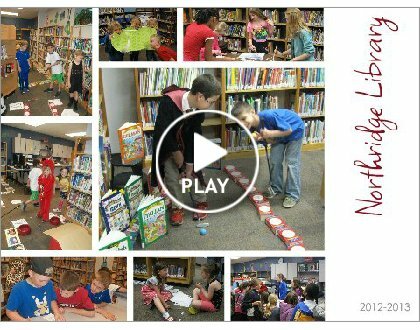 This culminating project provides students with the opportunity to showcase their knowledge, display responsible digital citizenship, and persuade others to visit North Dakota. Centennial students with library media specialist, Rhonda Bothwell, have been busy with activities and lessons based on library standards and technology standards. This year one activity with third through fifth grade was the arrangement of fiction and nonfiction books. This will lead the students to be lifelong learners. Assisting with library services is library assistant, Rhonda Schoonover. Grimsrud kindergarten students were excited to listen to books on brand new Nooks. Grimsrud library was able to purchase ten Nooks with book fair profits. Library media specialist, Crystal Molzahn, and library assistant, Cathy Bauman, help students use the Nooks, which have many features such as being able to search within the eBook, highlight, search dictionary in less time while reading, and differentiate font size, brightness, etc. Nooks provide an interactive environment, enhance reading, and enrich understanding for students. Highland Acres students with library media specialist, Rhonda Bothwell, have been busy with activities based on the library and technology benchmarks/standards. This group of fourth graders were busy learning about Google docs. Students learned how to open Google docs, create a word document, a folder, how to use drawing, and how to share. Most importantly we talked about the dangers and issues that can happen with misuse of technology. Assisting with library services is library assistant, Clem Steffan. Liberty students with library media specialist, Jan Schmidt, and library assistant, Laurie Cullen, set up and organized the new library using a genre based arrangement. Students worked on Project Based Learning to write, create, and develop group and individual projects using Google docs. They also created presentations, posters, and business cards to promote student created Smartboard wiimotes about ND tourism and energy development. Time was also spent writing and animating comic strips to show character development, plot, and sequence of events in a story. Younger students created movies using Web 2.0 tools to show understanding of sequencing. From day one, Lincoln Elementary students knew that they were going to be an integral part of creating the Lincoln Library. They were put in charge of sorting books into themes or topics and literally stocking the shelves in a way that would make the most sense to kids who would be checking out the books. Students have also been responsible for creating picture labels for the different genres and themes or topics. These labels are now being put on all books. The 3rd graders also felt it was important that students at Lincoln are able to recognize the difficulty level of the book they are choosing. Therefore they have set up the task of using Scholastic Book Wizard to find the guided reading level of each book. Besides the library work, students K-4 have delved into technology in various ways with library media specialist, Barbara Sandstrom. Students created a picture dictionary about parts of the computer, google maps, movies, advertisements, online posters, songs, and have even dabbled in Claymation. Assisting with library services is library assistant, Naomi Karlin. Miller students with library media specialist, Debbie Job,, have been busy with activities and lessons based on library and technology standards. Pictured are Mrs. Roth's 5th graders working on timelines of the events surrounding the Titanic. Assisting with library services is library assistant, Beth Thompson. Kindergarten students at Moses Elementary library with library media specialist, Crystal Molzahn, participate in a retelling of the noodlehead story, Epossumondas, by Coleen Salley. Assisting with library services is library assistant, Sandra Stephens. Murphy Elementary Media Center uses a variety of ways to keep students engaged and help them become lifelong learners while focusing on standards/benchmarks. Some of the activities we work on are creating student biographies, researching, using technology to create end projects, use of games/gaming, variety of exciting culminations, etc. Library media specialist, Gail Stein, and library assistant, Mary Jane Kadrmas, create a library atmosphere to keep the fun in reading and learning! The Myhre students enjoyed Skyping with their partner classroom in Alabama. It was a great experience learning about our friends to the south. This fun activity set up by library media specialist, Peggy Kopp, was a welcomed break after our work on essential library skills and digital learning activities. Students also worked with non-text features to enhance their research projects. Library assistant, Charlotte Sather, helps facilitate student growth and instills a love of reading with her creative story telling. The Myhre Library is a busy place where students and staff enjoy the inviting, open atmosphere. Northridge students have been busy this year working on library standards as well as technology standards. We covered the Dewey Decimal System, parts of a book, retelling story, sequencing, along with many more library activities. Third through fifth grades learned how to use the online catalog system to log into their accounts, search for materials, and place their own holds. In the computer lab we had many projects from creating Word documents to writing biographies. We also had most of our classes complete a research project using both print materials and online databases. The fifth graders created commercials based on the Lifeskills. They wrote scripts, rehearsed, filmed, and edited the entire commercials on their own. All students K-5 were also part of a special project for our physical education teacher this year; everyone had a part in the special video that we created. Reading month was an extra special time here at Northridge this year. We had a busy month full of activities that started in the library media center and radiated to all the classrooms. It was a fun and busy year here at Northridge Elementary, especially for our library media specialist, Mandi Clausen who is new to the administrator role in the library and our library assistant, Alisha Kelim, who is new to the district. We are looking forward to what next year has to bring! Pioneer students dove into learning about how the library is organized by doing treasure hunts and working in Dewey Decimal stations. Fourth grade completed a Dewey Webquest where their finished product was to create new labels for the book shelves in the hopes students would become more independent when finding their desired books. Library media specialist, Barbara Sandstrom, and classroom teachers collaborated on project based learning lessons around getting grass for the playground, social studies research, developing a web quest, and creating a mini-society called "Cliffindale" with a unique money system known as the "spark." Students in grades 2 - 5 have been taught a variety of technology skills encompassing google docs, creating forms, designing web or webquest pages, and powerpoints. Assisting with library services is library assistant, Sharon Dreschsler. Great things are happening in the Prairie Rose Elementary Library! This year, library media specialist, Misti Werle, and library assistant, Julie Bitz have added library centers and flipped lessons to the library checkout time to engage students. Baskets and bins have been added to the library to make books easier for students to locate, and we have more than doubled our circulation of books. We have continued to apply library and media skills to grade level curriculum through collaboration with classroom teachers, integrated project based learning projects, and applied skill practice. Students have learned how to be a great digital citizen and created a school wide music video on using technology appropriately. Then, students used the technology to locate information, create products, collaboration with others, communicate what they know, and show their creativity! We had many successful clubs in the library this year. Over 80% of students in grades 1-5 participated in lunch time book clubs, and our 5th grade Storytelling Club had 3 public performances this year. Lastly, we had many special events this year from bookfairs to the Pumpkin Storybook Patch, and even an Elf on the Shelf made an appearance in the library this year. The library media program at Prairie Rose is successfully engaging and instructing our students. At Roosevelt Elementary Library this year, we have continued to work hard on increasing our easy non-fiction section. At the beginning of the year, our first grade students met with a book representative and selected the books they most wanted to have in our library. Now all grade levels are enjoying their selection and the circulation of non-fiction books has sky rocketed! Library media specialist, Misti Werle, collaborates with classroom teachers on research, information, and technology projects. Students created videos, animations, digital maps, and much more! We are saying goodbye to our library assistant, Joyce Robinson this year; she will be greatly missed by all staff and students. Saxvik students with library media specialist, Jan Schmidt, worked on 21st Century Learning skills by learning to create and share documents with Google Docs, Voice Thread, Photo Story, Kerpoof and other Web 2.0 tools. Students also spent time using the Nooks and other interactive websites to support school wide math and reading goals. Assisting with library services is library assistant, Kelly Humann. The Solheim kindergarten classes with library media specialist, Lynda Brady, collaborate on research of their insect unit by creating a lady bug glyph. The students follow directions to make the parts of the ladybug using the Microsoft paint program. They are then instructed on how to Save their paint drawing to be printed and displayed in their classrooms after they are finished. Assisting with library services is library assistant, Sheila Roth. This collage is from the Sunrise Family Reading Night. This is the 4th year we have had the family event which usually takes place in March, celebrating all the reading we did during the month of February - North Dakota Reading Month. Library services at Sunrise are provided by library media specialist, Lesley Gunderson, and library assistant, Brenda Rebel. Will Moore students enjoyed a variety of fun activities for their reading celebration! A few examples of the activities are book reviews, poetry breaks, partner reads, round robin reading, author spotlight, spot-drop-read. Also during this school year students used a number of new technology programs/tools to enhance learning and culminate lessons taught by library media specialists, Gail Stein and Mandi Clausen. Assisting with library services is library assistant, Nancy Brown. The BPS District Library Media Center at Hughes provides instructional resources and equipment for BPS teachers and for teachers from area public and private schools with Teacher Center memberships. The district library collaborates with the education departments at University of Mary, Dickinson State at BSC campus, and United Tribes to provide university education students with resources for lesson plans and the equipment to design educational projects and activities. The new Common Core State Standards list skills to prepare American young people on the path toward the college and careers of their choice. Yet as students are on their journey to and through college, and ultimately through life, they also need to develop the lifelong enjoyment of reading. With that in mind the BHS library staff, library media specialist Charlotte Hill with library assistants Mollie Mihelich and Laura Rysavy, made every effort to create displays that would encourage students to find materials of interest not only for independent classroom reading but for leisure reading. Our Animoto video below showcases some of the displays that were successful in promoting reading for our students. The CHS library staff, library media specialist Bonnie Kettleson with library assistants Donna Geiger and Pat Leno, helped English teachers use Noodletools with their classes this year. Noodletools is an integrated online tool for note-taking, outlining, creating citations, and completing collaborative research and writing. From the beginning, our CHS teachers did a masterful job. English teacher, Karri Landeis, summarized the teachers' and students' ease and success with Noodletools, "Noodletools proved to be a beneficial addition to my research paper unit for all classes - English 11 to AP English 12. It allowed me to offer immediate feedback to students and work closely with them on note-taking, outlining, and creating an MLA works cited page. Students were organized and had all necessary tools to be successful; in fact, because so many of my seniors found Noodletools to be a helpful resource, they inquired about purchasing access to the program to use when they begin college, saying, 'I won't complete a research paper again without it!'" South Central High School students enjoy the new resources at the SCHS library and access to interlibrary loan and online databases, provided by the district library. The library day at Simle Middle School begins at 7:20 AM. Students come in early to complete homework, especially those who are working in groups. We have a group of 20 "regulars" who are here every morning to read books and magazines. Reading tutors and the ReadRight program use the Simle library every hour for one-on-one or small group instruction. SMS library, with library media specialist Robin Kress and library assistant Tracy Diede, has a constant hum of quietly reading voices and averages 2,000 check outs per month. Class projects in the Simle library include the following: research using Google Docs and NoodleTools; literary responses with Wordle; building catapults research; planet Powerpoints; research of North Dakota cities; settler's journals, reading class genre booktalks; and artist Fakebook. All class periods in the library are scheduled almost every day. We see approximately 100 drop-in students each day. Seventh graders in Dave Augustadt's Band classes are eager to learn how to compose music digitally. Using the computers in the library, with the library media specialist Mary Miller, students access Noteflight, an online music writing application, to create melodies for the instruments that they play in band. Students use MIDI (Musical Instrument Digital Interface) to create original compositions and electronically send their musical scores to their instructor. Centennial Elementary fifth grade students work on History Comes Alive projects. The fifth grade classroom teachers collaborate with the library media specialist, Rhonda Bothwelll to teach students how to use databases, books, and other media to research a United States topic. Mrs. Bothwell also works with the fifth graders on how to write a bibliography page. After all fifth graders complete their project they give a presentation to their class. The fifth graders also hold an open house for all parents and other classrooms to come and see their final projects. Assisting with library services is library assistant Rhonda Schoonover. The Grimsrud kindergarten classes with library media specialist, Crystal Molzahn, learn how to log on and off a computer, shut down the computer, navigate a website, enter a web address, and properly care for the equipment they are using. They explore many good fit websites and computer programs and display growing independence with every lesson. Assisting with library services through this process is library assistant, Cathy Bauman. Second grade students at Highland Acres participate in a Mo Willems author study with library media specialist, Gina Phillips. As part of this study, students observe the language Willems uses in various books, learn how to illustrate the pigeon, and write persuasive letters from the point of view of the Pigeon. The students study the illustrations of Mo Willems, compare and contrast his many book series, use digital cameras to photograph Highland Acres, and practice alphabetical order by placing drawn objects onto the pictures of Highland Acres. This picture and writing sample are an example of some of the students' illustrations and writing. Assisting with library services through this process is library assistant Clem Steffan. Research and Reading - that's our specialty! The Miller library, with library media specialist Debbie Job and library assistant Beth Thompson, received a facelift this year when it turned into Storybook Island. The Miller kids have been enjoying immensely their new brighter, happier library as they work on projects and enjoy a good book. From our record-breaking book fair to our amazing presentations with digital learning environments, we have had a great year. The Dorothy Moses 6th graders with library media specialist, Crystal Molzahn, collaborate on research of famous children's book illustrators. They learn keyword search strategies, how to identify reliable websites, and the importance of citing sources. They use GoogleDocs to create and present their final product to the class. Assisting with library services through this process is library assistant, Sandra Stephens. Want to know what students really learned in library today, and what skills need review and reinforcement? Use exit slips! In about 5 minutes or less - students state in writing what they learned from their library media lesson. Exit slips provide students with an opportunity to take stock of their learning, and let the library teachers know whether students "got it" (and how they may be personalizing the information) or if re-teaching or reinforcement is necessary. This is happening at the Rita Murphy Elementary Library as the students leave the library after a lesson from library media specialist Gail Stein and library assistant Mary Jane Kadrmas. Library media specialist Pam Wohlsdorf and library assistant Charlotte Sather at Myhre plan reading activities for their students and use their creativity to instill the love of reading and lifelong learning. Northridge Elementary library staff, library media specialists Jan Schmidt and Mandi Clausen along with library assistant Mary Buechler, have been focusing on researching, writing and using technology with Northridge Elementary students this year. Kindergarten students practice phonics, write complete sentences, and write letter poems in Tux Paint. Students in first grade research animals and write class Very Hungry Caterpillar books to enhance sequencing skills. Second graders also research jungle animals, write research paragraphs, and paint pictures for a Powerpoint presentation shown at the music program. Third graders learn to use Photostory and digital cameras to take photos to support common core math expectations. Fourth graders learn the importance of theme, setting and plot in creating movies and comic strips. They also research animals of North Dakota, create Powerpoints, and present their projects. Fifth graders explore using Google Earth to understand latitude and longitude with recorded tours. They also integratd many different types of writing including persuasive, informative research into Glogster posters and Word. Sixth graders integrate math concepts into a Photostory using digital cameras to be shared with younger students. Students also practice using Googledocs to share and peer-edit writing for language arts. They finish the year by creating stop-motion movies that depict theme, setting and plot. In the library, all grades celebrate the end of the year with Dewey Golf. Ten holes of mini-golf are created in the library; each hole represents a section of the Dewey decimal system. Dressed as their favorite book character, students put their way around the library. To incorporate math, score cards are included and students celebrate the highest and lowest scores. It is exciting to see the kids score a Hole-In-One with books. Pioneer students with library media specialist, Gina Phillips, create podcasts using Netbooks checked out from Technology. Students practice retelling their stories with their partner and record stories using Audacity. Assisting with library services through this process is library assistant Sharon Drechsler. Prairie Rose students have been working on their nonfiction writing, while their classroom teachers have been collaborating with the library media specialist, Misti Werle. Working as a team and using the Project Based Learning model, students have completed a variety of integrated projects this year. Here you see students using their R.A.N. charts to organize their research from the database PebbleGo. Assisting with library services through this process is library assistant Julie Bitz. Riverside kindergartners enjoy some Rhyme Time with Mrs. Jane Wolf, the library media specialist. Students brainstorm many rhyming words. Each student eventually chooses two rhyming words, creates a sentence, and illustrates it using Tux Paint. They learn that the keyboard not only has letters and numbers, but also keys to make uppercase letters and punctuation marks. Students enjoy reading their rhymes. Mrs. Laurie Cullen, the library assistant, shows students where other rhymes and poems can be found in the school library. Roosevelt Library with library media specialist Misti Werle and library assistant Joyce Robinson have been busy increasing access to non-fiction text. We have added many non-fiction titles for primary students, and are continuing to expand this part of our collection. For the upper grades, students enhanced and promoted different areas of the non-fiction section by creating signs for their favorite and most popular areas. We love non-fiction! Kelly Humann, library assistant at Saxvik, creates Seuss inspired truffula trees to celebrate Reading Month. The bright colors and spring inspired decorations cheer up a long winter. During this time, examples of lessons taught by library media specialist, Gina Phillips, include 3rd graders studying reference as they read The Secret of the Rock, work on reference activities, and study biographies via learning about Harry Houdini. 4th graders research states to learn what makes a state unique and plot the information on Google Maps. The 5th and 6th graders collaboratively write a Choose Your Own Adventure story, as they study the CYOA genre, determine point of view, tense, etc. The students use Google Presentations to create the story, and for many students, this is their first experience with Google Drive. They learn how to create a presentation, share it with their partners and teacher, collaboratively create slides, and link the slides to create different paths for their story endings. Solheim students create The Odyssey and The Iliad comic strips. Mr. Wingenbach, the 6th grade social studies teacher, provides the students with a rubric and guides them while they develop their storyline. Mrs. Wolf, the library media specialist, helps students create their comic in Bit Strips, a web based comic creating program. Students share their comics with their classmates and continue to use the program for other classroom projects. Library assistant, Sheila Roth, shares graphic novels with the students in the library. Sunrise students with library media specialist Lesley Gunderson and library assistant Brenda Rebel, are enjoying Family Reading night, the culminating activity for reading month. Reading month begins with a Bingo for Books and Bookswap event, which is a collaborative event with the Sunrise PTO and the Sunrise Library. Will-Moore students enjoy being in the computer lab working on book trailers. With library media specialist Pam Wohlsdorf they learn how to download and save images, add music, and upload to Animoto. The students add text to create a book trailer to encourage others to want to read the books they choose. Assisting with library services through this process is library assistant Nancy Brown. ND Library and Technology Content Standards including Bismarck Public Schools Library Media I Can Statements, KRSP, and three skill stages of introduce, develop and maintain, master.